The report found there was a "disregard for human life" of a large number of patients from 1989 to 2000. Prime Minister Theresa May described events at Gosport as "deeply troubling" and apologised to families over the time it took to get answers from the NHS. Health Secretary Jeremy Hunt told MPs police and the Crown Prosecution Service (CPS) would examine material in the report to consider their next steps and "whether criminal charges should now be brought". Bridget Reeves - whose grandmother Elsie Divine, 88, died at the hospital in 1999 - said: "These horrifying, shameful, unforgivable actions need to be disclosed in a criminal court for a jury to decide and only then can we put our loved ones to rest." 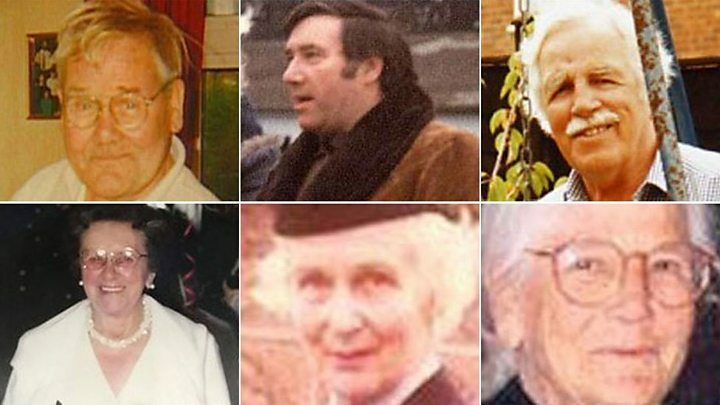 Former Bishop of Liverpool James Jones, who led the Gosport Independent Panel, said: "The documents seen by the panel show that for a 12-year period a clinical assistant, Dr Barton, was responsible for the practice of prescribing which prevailed on the wards. "Although the consultants were not involved directly in treating patients on the wards, the medical records show that they were aware of how drugs were prescribed and administered but did not intervene to stop the practice." Relatives had said they hoped the findings of the report would end their "harrowing" wait for answers. The document said families were "consistently let down" by those in authority, both medical individuals and institutions, when they complained about the treatment of their loved ones. Bishop Jones, who also headed the Hillsborough Inquiry, said: "It's not for the panel to ascribe criminal or civil liability. "It will be for any future judicial processes to determine whatever culpability and criticism might be forthcoming." Chief Constable Olivia Pinkney, of Hampshire Constabulary, said the force had "co-operated fully" with the panel and "shared with them more than 25,000 documents containing 100,000 pages of information". "We will assess any new information contained within the report in conjunction with our partners in health and the CPS in order to decide the next steps," she added. The CPS said it will "consider" the report and take "any appropriate steps as required". The report said an "awareness" that the deaths "might be due to 'another Shipman'" had "cast a shadow over how concerns at the hospital were viewed". 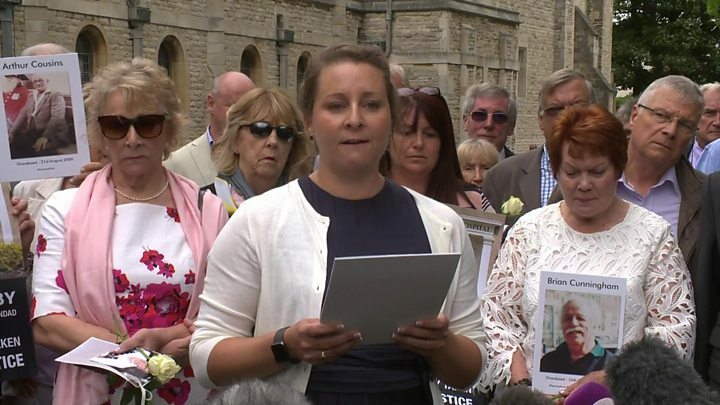 "The police focused on the allegation that Dr Barton was guilty of unlawful killing, rather than pursuing a wider investigation," the report added. "Hampshire Constabulary approached Dr Barton's managers, including the then chief executive at the trust and Dr Althea Lord, the responsible consultant, in a way that ignored the possibility that they too might have been subject to investigation." It said the quality of the force's three investigations was "consistently poor". The panel found officers had a mindset of seeing family members who complained as "stirring up trouble" while seeing the hospital as the place to go for guidance and assurance during their inquiries. The report added: "There was an institutionalised regime of prescribing and administering 'dangerous doses' of a hazardous combination of medication not clinically indicated or justified, with patients and relatives powerless in their relationship with professional staff." Gosport MP Caroline Dinenage said it highlighted many "failures" by the authorities to properly investigate. She said: "I can't even imagine what the families must be going through - it's absolutely heartbreaking." Nursing staff first raised concerns about the poor prescribing and administration of opioids at the Gosport Memorial Hospital nearly 30 years ago but their fears were "silenced" by management, the inquiry revealed. In 1991, Anita Tubbritt, a staff nurse at the hospital rang Keith Murray, the local Royal College of Nursing branch convener, to express concerns she and other staff shared over the use of diamorphine and syringe drivers. The report said the nurses gave the hospital a chance to rectify the practice and in choosing not to do so "deaths resulted and, 22 years later, it became necessary to establish this panel in order to discover the truth of what happened". Janet Davies, chief executive of the Royal College of Nursing, said the report made for "very sober reading for everybody involved in the care of patients". "Nursing as a profession must work hard to seek out lessons from Gosport and we expect that approach to be shared by regulators and the health and care system," she added. "The report is right to praise the bravery shown by the nurses who raised concerns. It highlights how difficult it can be for nursing staff to challenge the decisions taken by others." Image caption Health Secretary Jeremy Hunt said there had been a "catalogue of failures"
The health secretary described the findings as "truly shocking". He said "brave nurse whistleblowers" had first raised concerns in 1991, as well as families. He added there had been a "catalogue of failures", including by the Department of Health. A report first compiled by Prof Richard Baker in 2003 - and published 10 years later - found evidence of an "almost routine use of opiates" since 1998. At the launch of the inquiry four years ago, former Care Minister Norman Lamb said it would address what he called "unanswered questions" about the care of those who died. "There has been a real systemic failure here. . . a closing of ranks in my view," he said. The Lib Dem MP has now called for an "independent and thorough" police investigation. Shadow Health Secretary Jonathan Ashworth said the "substantial" 370-page report would take time to absorb. "Families were too readily dismissed, it's shameful," he said. Ken Woolley's father John died at Gosport in 1996 aged 68 after being admitted for a broken hip. "As soon as we saw him the next day he was unable to communicate due to the drugs they'd given him," he said. "There was another 11 days where he still couldn't communicate before he died. "Something has to come of this - they have to get to the bottom of it." Gosport hospital deaths: Who is Dr Jane Barton?